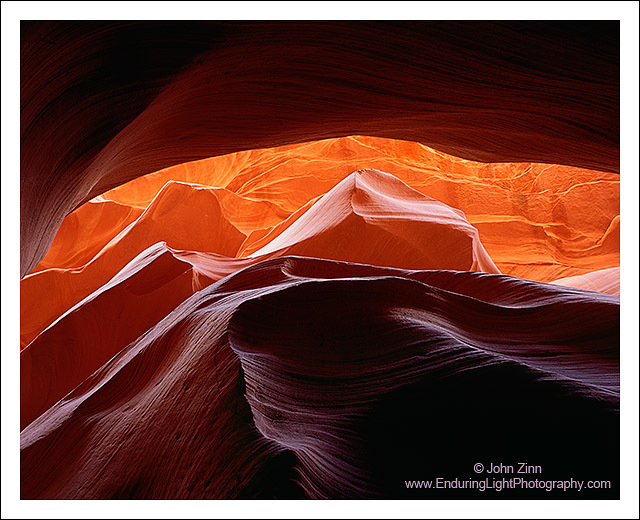 I first photographed this scene in Antelope Canyon at the beginning of my career as a photographer on my first trip out West, long before it became a tourist stop. Unfortunately, since I was using 35mm film at the time, my original shot did not have the detail that I wanted. So after 11 years, I returned to recapture a fresh version of one of my favorite photographs, now using my large format 4x5 camera. The perspective on this photograph is looking staight up in a narrow slot canyon. Carved into a soft seam of sandstone by repeated flash floods, the walls of the canyon now mimic the shape of the water that formed them.